Alexander and I did a great MAKE project this weekend. We made one of these BlinkyBugs. It is a wonderfully simple project that can be made with about $5 worth of stuff. The battery was the most expensive component. RadioShack had most of the supplies, with the exception of the copper tubing which we bought at a local hardware store (of course I had some spare guitar strings on hand!). It took less than a half hour to do the whole thing. It demonstrates some very simple electronics, shows how you can make someting that has dual-purpose elements (structural and active electronic) and makes a fun interecative toy too! This could easily be a good classroom or camp/scout project. 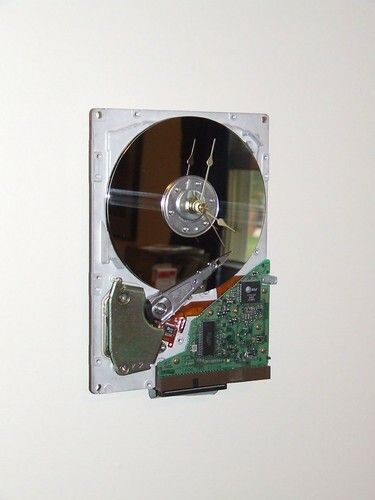 Who doesn’t have a spare dead hard drive lying around….Via Gizmodo I found this great DIY project for turning an old hard drive into a very attractice geek-chic clock. This is definitely a project for an upcoming weekend.